C-reactive protein (CRP) is a component of the acute phase response to infection, inflammation, and trauma. A major activity of acute phase proteins is to limit the inflammatory response. It has been demonstrated that CRP protects mice from lethal doses of LPS. In the mouse, CRP binds to the regulatory receptor, FcγRIIb, and to the γ-chain-associated receptor, FcγRI. The goal ofthis study was to determine whether FcγRs are necessary for the protective effect of CRP. The ability of CRP to protect mice from a lethal dose of LPS was confirmed using injections of 500 and 250 μg of CRP at 0 and 12 h. CRP treatment of FcγRIIb-deficient mice increased mortality after LPS challenge and increased serum levels of TNF and IL-12 in response to LPS. CRP did not protect FcR γ-chain-deficient mice from LPS-induced mortality. Treatment of normal mice, but not γ-chain-deficient mice, with CRP increased IL-10 levels following LPS injection. In vitro, in the presence of LPS, CRP enhanced IL-10 synthesis and inhibited IL-12 synthesis by bone marrow macrophages from normal, but not γ-chain-deficient mice. The protective effect of CRP appears to be mediated by binding to FcγRI and FcγRII resulting in enhanced secretion of the anti-inflammatory cytokine IL-10 and the down-regulation of IL-12. These results suggest that CRP can alter the cytokine profile of mouse macrophages by acting through FcγR leading to a down-regulation of the inflammatory response. C-reactive protein (CRP)3 is an acute phase serum protein (1, 2). The blood level of these proteins increases to varying degrees in response to inflammation, trauma, or infection. Acute phase proteins are primarily produced in the liver as a response to cytokines produced by macrophages including IL-1 and IL-6. These proteins play important roles in protection against infection, clearance of effete tissue, prevention of autoimmunization, and regulation of the inflammatory response. CRP is considered to be the prototypic acute phase reactant in man because its concentration in the blood increases from <1 μg/ml to several hundred micrograms per milliliter in the first 24–48 h of the acute phase response. Structurally, CRP is composed of five identical subunits arranged as a cyclic pentamer (3). The B (binding) face has five ligand-binding sites that each interact with two calcium atoms. The prototypic ligand for CRP is phosphocholine (4), which is found on a variety of pathogenic bacteria and on phosphatidylcholine in membranes where it is exposed following membrane damage (5). CRP also interacts with nuclear Ags, especially small nuclear ribonucleoprotein particles (6). The opposite or A face of CRP contains sites that interact with C1q to activate the classical C pathway and sites that are proposed to interact with FcγRs on phagocytic cells to mediate phagocytosis (7, 8). CRP has been shown to have both proinflammatory and anti-inflammatory effects in vitro and in vivo. In vitro, CRP induced the production of IL-1 and TNF by human monocytes and mouse macrophages (9, 10, 11). However, CRP and other acute phase proteins also enhanced production of IL-1RA in human PBMCs (12, 13). Injection of CRP increased myocardial injury in an ischemia-reperfusion model that was dependent on C activation (14). In other studies, elevated levels of CRP appeared to be anti-inflammatory, decreasing alveolitis in response to chemotactic factors (15). High concentrations of CRP also inhibited neutrophil chemotaxis in vitro (16). The ability of CRP to protect mice from lethal challenge with LPS has been demonstrated in mice rendered transgenic for rabbit CRP (17) and in mice given human CRP by injection (18). To our knowledge, the ability of mice expressing human CRP as a transgene to resist LPS challenge has not been tested. These apparent discrepancies in the effect of CRP on the inflammatory response may be due to differential engagement of proinflammatory and anti-inflammatory FcγR and activation of C.
The FcγR family is composed of three major groups, FcγRI, FcγRII, and FcγRIII (19). FcγRI is the high-affinity receptor for IgG and along with FcγRIII induces activating signals in response to cross-linking. In the mouse, FcγRII is a low-affinity receptor for IgG that delivers a regulatory signal to leukocytes (20). CRP binding to the activating receptor FcγRI and the regulatory receptor FcγRII has been demonstrated (21). The balance between activation of these two receptors may explain the pro- and anti-inflammatory properties of CRP. Although the use of human CRP in the mouse is somewhat artificial, this model has proven useful in a number of studies of CRP function (22, 23, 24). By passively administering CRP into mice that express only low levels of mouse CRP, the timing and concentration of the CRP can be experimentally manipulated. The FcR interactions appear to be quite similar between man and mouse in that CRP binds to FcγRI and FcγRII in both man and mouse. In both cases functional studies have failed to show an interaction between FcγRIII and CRP. Because FcγRII in the mouse is present only in inhibitory forms (FcγRIIb, containing immunoreceptor tyrosine-based inhibitory motifs), this simplifies the interpretation of the results using FcγRII-deficient mice. In the current study, the effect of CRP on a strong inflammatory stimulus was examined. Under these conditions, CRP has a clear anti-inflammatory activity that protects mice from lethality due to LPS challenge. Although the ability of CRP to protect from LPS was discovered >8 years ago, the mechanism remains unknown (25). In transgenic mice, induction of CRP synthesis by diet increased resistance to lethality from LPS, platelet-activating factor, TNF plus IL-1, and galactosamine plus LPS but not TNF alone (17). The recent finding that CRP interacts with cells through FcγR suggests a possible mechanism for CRP-mediated protection (8, 21, 26). It has been demonstrated that IgG complexes or IgG-coated E can induce the production of the anti-inflammatory cytokine, IL-10, and decrease the production of the proinflammatory cytokine, IL-12 (27). It was further demonstrated that macrophages preincubated with a low dose of LPS and E-IgG could protect mice from endotoxin challenge (28). Therefore, we postulated that CRP might act in a manner similar to IgG to limit inflammation during the acute phase response. In these studies, the ability of CRP to protect mice from lethal LPS challenge was reexamined in normal mice and in mice deficient in different FcγR. Specifically, the effect of CRP on the survival of mice deficient in either FcR γ-chain or in FcγRIIb challenged with a lethal dose of LPS was measured. The levels of TNF, IL-10, and IL-12 were measured in the blood of LPS-challenged mice. The effect of human CRP administration on these cytokines was compared with the survival of LPS-challenged mice treated with CRP. The results suggest that the administration of human CRP leads to an alteration in the balance of pro- and anti-inflammatory cytokines, which alters survival of mice exposed to an inflammatory stimulus. Human CRP was purified from pleural fluid by affinity, gel filtration, and ion exchange chromatography as previously described (29). The purity of the CRP preparations was determined by 12.5% SDS-PAGE on overloaded and normal samples. The gels were stained with a sensitive silver stain. No bands other than the major 25-kDa CRP band were seen. Specifically, no contamination by IgG was seen. Endotoxin was removed from CRP by passage over an ActiClean Etox column (Sterogene Bioseparations, Carlsbad, CA). Endotoxin levels were <0.1 ng/mg protein as measured by a chromogenic Limulus amebocyte lysate assay (BioWhittaker, Walkersville, MD). LPS (Escherichia coli O127:B8 no. L3129 and O55:B5 no. L2880 (prepared by phenol extraction)) were purchased from Sigma-Aldrich (St. Louis, MO). Male C57BL/6Ncr mice were purchased from the National Cancer Institute (Frederick, MD). FcγRIIb-deficient mice (30) and FcR γ-chain-deficient mice (31) on a C57BL/6 × 129 background were bred at the Veterans Affairs Veterinary Medical Unit (Albuquerque, NM) from breeder pairs purchased from The Jackson Laboratory (Bar Harbor, ME). The γ-chain-deficient mice do not express functional FcγRI, FcγRIII, or FcεRI. The FcγRIIb-deficient mice lack individual receptor expression only. Both male and female FcγR-deficient mice were used. All mice were housed conventionally and were used between 7 and 14 wk of age. All experimental procedures involving animals were approved by the Institutional Review Board of the Department of Veterans Affairs Medical Center (Albuquerque, NM). Bone marrow macrophages (BMMs) were prepared as previously described (32). Briefly, mice were killed, femurs were isolated under sterile conditions, the ends of the femurs were excised, and bone marrow was flushed from the femurs in HBSS with 0.2% human serum albumin. Cells were resuspended in 12–15 ml DMEM with 2% FCS and 2% L cell-conditioned medium and allowed to adhere to tissue culture dishes for 2 h. Nonadherent cells were removed and cultured in tissue culture flasks in DMEM, 2% FCS, and 15% L cell-conditioned medium, for 7–10 days. Nonadherent cells were removed after overnight culture, and cultures were fed after 4 days. BMMs were removed from tissue culture flasks with 5 mM EDTA 12 h before use and were then grown overnight in DMEM with 10% FCS, 2 mM glutamine in 24-well plates. Macrophages were cultured at 4 × 105 cells/ml in 0.5 ml of medium per well. Supernatants were collected 8 h after addition of the stimuli. For protection against lethality, mice were challenged with 500 μg of 055:B5 LPS i.p. at time 0. Mice received i.v. injections of 500 μg of CRP at time 0 and 250 μg of CRP at 12 h. Control mice received TBS i.v. at 0 and 12 h. Mice were monitored at 6- to 12-h intervals. For cytokine assays, mice were injected with 200 μg of CRP 2 h before the injection of 50 μg of LPS. Mice were then bled at the times indicated in the legends and the serum was analyzed for the cytokines of interest. Serum and cell culture supernatants were assayed for IL-12 p70, IL-10, and TNF by ELISA (BD PharMingen, San Diego, CA). For LPS stimulation of macrophages, cultures were treated with 0.1–100 ng/ml of O127:B8 LPS. CRP-treated cells received 100 μg/ml of purified, endotoxin-free CRP. This concentration of CRP is sufficient to provide near saturation of binding and activation of macrophages through FcγR. Graphical and statistical analyses were performed using GraphPad Prism software (GraphPad, San Diego, CA). Survival curves were plotted by the method of Kaplan and Meier and compared by the log-rank test (Mantel-Haenszel test). This analysis takes into account the time of death as well as the absolute numbers of mice surviving. Throughout the results the term “protection” indicates significantly enhanced survival. Cytokine levels were compared by t tests. Values of p < 0.05 are considered significant and are represented on graphs as ∗. Values of p < 0.01 are considered to be highly significant and are represented by ∗∗. Previous studies showed that rabbit CRP expressed as a transgene in mice could protect mice from LPS-induced mortality (17). These investigators could not reproduce this effect using passively administered CRP. However, others reported that human CRP could provide protection from LPS when given at higher doses (18). Other studies have shown that CRP is also protective from LPS from Vibrio vulnificus (33). To confirm that passive administration of human CRP can protect mice from challenge with a lethal dose of LPS, C57BL/6 mice were challenged with 500 μg of LPS at time 0. One group of mice received 500 μg of CRP at time 0. A second group received 500 μg of CRP at time 0 and 250 μg of CRP at 12 h. The third group of mice received saline at 0 and 12 h. Survival was followed for 7 days. 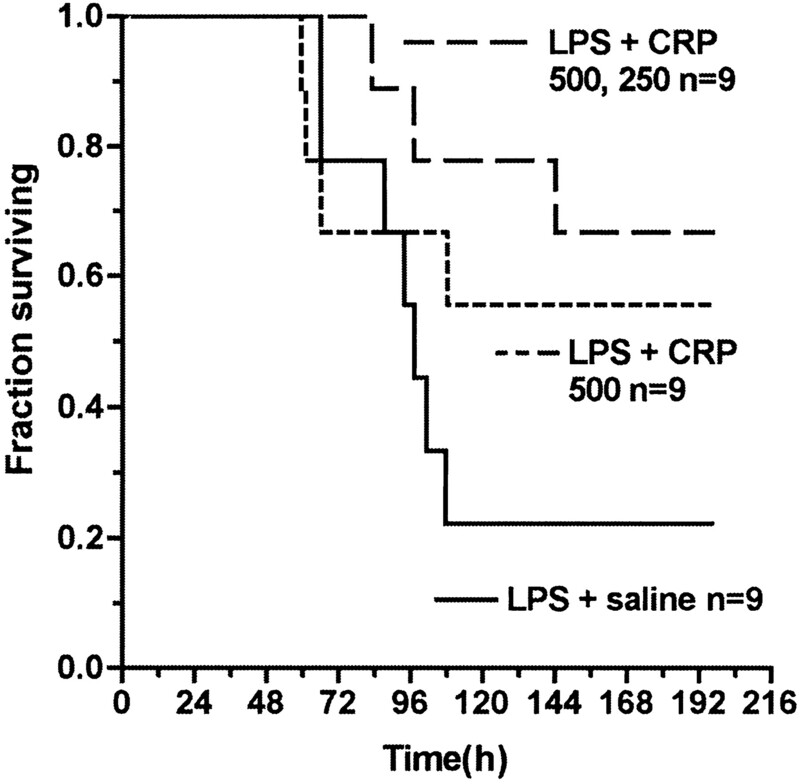 Mice receiving CRP using either protocol showed enhanced survival as compared with saline-injected mice (Fig. 1⇓). The protocol that included a second injection of CRP resulted in greater protection than the single injection protocol and was used in subsequent experiments. Passive administration of CRP protects mice from lethal challenge with LPS. C57BL/6 mice were injected with 500 μg of LPS at time 0. Mice were also injected with either saline at 0 and 12 h or with 500 μg of CRP at 0 h and 250 μg of CRP at 12 h. A third group of mice received 500 μg of LPS at time 0 and 500 μg of CRP at time 0. 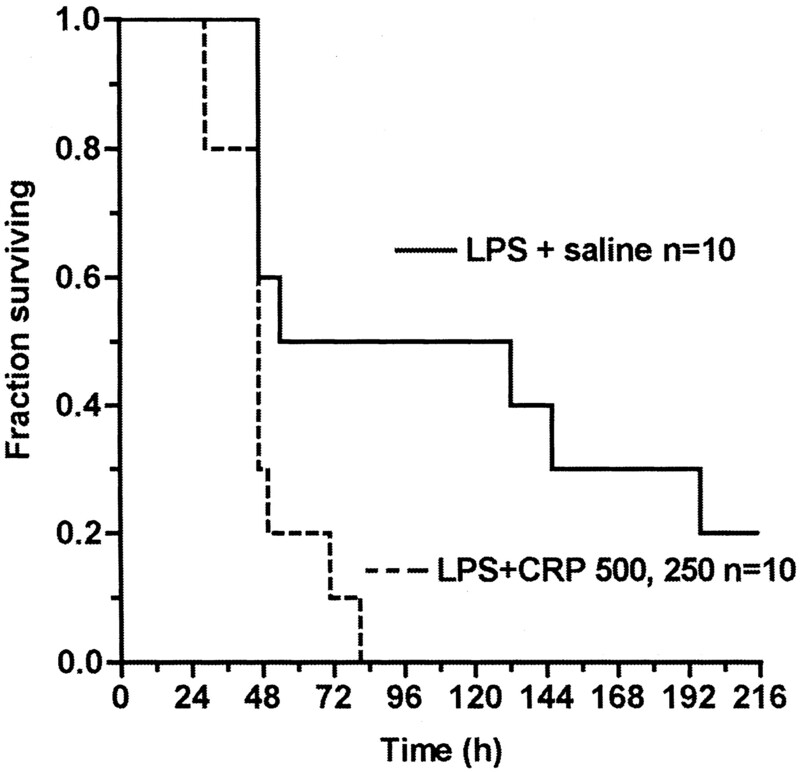 The survival of mice that received two injections of CRP was significantly increased compared with mice injected with saline and LPS (p < 0.05). Our previous studies have demonstrated that CRP interacts with mouse FcγR to induce phagocytosis of opsonized particles (32). In the mouse, phagocytosis of CRP-opsonized particles is mediated by FcγRI and C. Phagocytosis of IgG-coated particles through FcγR can change the cytokine profile of LPS-challenged mice (28). To determine whether FcγRI was involved in the protective effect of CRP for LPS challenge, mice deficient in the γ-chain were studied. These mice do not express functional FcγRI or FcγRIII. Unlike the normal mice, no significant protection from or exacerbation of mortality following LPS challenge was observed (Fig. 2⇓). These results when compared with the results in normal mice indicate that a γ-chain-dependent receptor is required for the CRP-mediated protection of mice from LPS. As our previous studies have failed to detect an interaction of CRP with FcγRIII, it is most likely that the required receptor is FcγRI (34, 35). CRP does not protect γ-chain-deficient mice from lethal challenge with LPS. FcR γ-chain-deficient mice were injected with 500 μg of LPS at time 0. Mice were also injected with either saline at 0 and 12 h or with 500 μg of CRP at time 0 and 250 μg of CRP at 12 h. There was no difference between the survival curves of the two groups. As CRP was also shown to bind to FcγRIIb in the mouse, the effect of CRP on the survival of FcγRIIb-deficient mice upon LPS challenge was examined. FcγRIIb contains an immunoreceptor tyrosine-based inhibitory motif in the intracellular region and is a regulatory receptor in the mouse. FcγRIIb-deficient mice were given two injections of CRP as described above and challenged with LPS. Not only did CRP not protect FcγRIIb-deficient mice from LPS challenge, but a significant increase in mortality was observed as compared with saline-treated mice (p = 0.01) (Fig. 3⇓). Thus, FcγRIIb is crucially involved in the protection from LPS mediated by CRP. Passive administration of CRP to mice deficient in FcγRIIb leads to increased mortality on challenge with LPS. FcγRIIb-deficient mice were injected with 500 μg of LPS at time 0. Mice were also injected with either saline at 0 and 12 h or with 500 μg of CRP at time 0 and 250 μg of CRP at 12 h. The survival of mice that received two injections of CRP was significantly decreased compared with mice injected with saline and LPS (p = 0.01). The survival of saline-treated FcγRIIb-deficient mice was not significantly different from the survival of saline-treated C57BL/6 mice (see Fig. 1⇑). To further examine the mechanism by which FcγRIIb-deficient mice showed increased mortality in response to CRP, the levels of proinflammatory cytokines in the blood were measured. FcγRIIb-deficient mice or C57BL/6 mice were injected with a sublethal dose of LPS 2 h after injection with either saline or 200 μg of CRP. One of the most important mediators of inflammation and tissue damage produced in response to LPS is TNF. Therefore, TNF levels were measured at 1, 2, and 4 h after injection of LPS. In C57BL/6 mice, the levels of TNF induced by LPS challenge were unaffected by the administration of CRP (Fig. 4⇓). However, CRP treatment significantly increased the levels of TNF at 1 and 4 h after LPS challenge in FcγRIIb-deficient mice (p < 0.05) (Fig. 4⇓). Therefore, one of the factors involved in the increased mortality seen in FcγRIIb-deficient mice treated with CRP may be the enhanced levels of TNF present in the blood. TNF levels are increased in the serum of FcγRIIb-deficient mice treated with CRP. C57BL/6 and FcγRIIb-deficient mice were injected with saline or 200 μg of CRP and 2 h later with 50 μg of LPS. Times are shown as hours postinjection of LPS. The 0 point samples were taken before the experiment. TNF levels were measured by ELISA. The results are presented as the means and SEM of samples from seven to eight mice in each group. ∗, p < 0.05; compared with saline-treated mice. IL-12 is also an important factor in LPS-induced lethality, acting primarily to induce the production of IFN-γ (36). The serum levels of IL-12 in C57BL/6 mice were not changed by LPS or CRP and LPS treatment. However, FcγRIIb-deficient mice treated with CRP showed dramatically higher levels of IL-12 at 1, 2, and 4 h after administration of LPS (Fig. 5⇓). These results suggest that the increased mortality in FcγRIIb-deficient mice may be due to an enhanced production of IL-12 and TNF induced by CRP. IL-12 levels are increased in CRP-treated FcγRIIb-deficient mice. C57BL/6 and FcγRIIb-deficient mice were injected with saline or 200 μg of CRP and 2 h later with 50 μg of LPS. Times are shown as hours postinjection of LPS. The 0 point samples were taken before the experiment. IL-12 levels were measured by ELISA. The results are presented as the means and SEM of samples from seven to eight mice in each group. ∗, p < 0.05. One of the primary mediators of IL-12 regulation is the anti-inflammatory cytokine, IL-10. Recent studies of the interaction of IgG complexes with FcγR suggest that this interaction enhances the production of IL-10 in response to LPS (27). Furthermore, these studies showed that the production of IL-10 was associated with protection of mice from LPS. It has been demonstrated that IL-10 production by macrophages is associated specifically with the ligation of γ-chain-associated FcγR. As CRP has recently been demonstrated to bind FcγRI, it was postulated that CRP could protect mice from lethality due to LPS challenge by ligation and cross-linking of FcγRI. The levels of IL-10 in the serum of the three groups of mice were compared (Fig. 6⇓). In wild-type mice, CRP treatment resulted in an increase in IL-10 at 1 and 4 h. In γ-chain-deficient mice, the IL-10 response was very low (<500 pg/ml) in the presence or absence of CRP. In the FcγRIIb-deficient mice, an increase in IL-10 was also observed although it proved not to be protective. IL-10 levels are increased in response to CRP in the serum of FcγRIIb-deficient mice and C57BL/6 mice but not in γ-chain-deficient mice. Mice in all three groups were injected with saline or 200 μg of CRP and 2 h later with 50 μg of LPS. Times are shown as hours postinjection of LPS. The 0 point samples were taken before the experiment. Levels of IL-10 were measured by ELISA. The results are presented as the means and SEM of samples from six to eight mice in each group. ∗, p < 0.05; ∗∗, p < 0.01. To directly examine the effect of CRP on LPS-stimulated macrophages, BMM were obtained from C57BL/6 mice. The cultures were incubated with LPS in the presence of CRP or saline and supernatants were collected after 8 h. Consistent with the results of others, LPS at doses up to 100 ng/ml did not produce a substantial increase in IL-10 (28). However, in the presence of CRP at 100 μg/ml there was a marked increase in IL-10 levels in response to LPS at concentrations of 10 and 100 ng/ml. CRP was not directly able to stimulate IL-10 production as shown by the absence of any IL-10 production at the lowest dose of LPS. As expected, LPS produced a substantial increase in the production of IL-12 by BMM. In the presence of CRP, there was a marked decrease in the production of IL-12 at concentrations of LPS of 10 and 100 ng/ml and these decreases were statistically significant (Fig. 7⇓). The increase in IL-10 was not observed when BMM from FcR γ-chain-deficient mice were tested (Fig. 7⇓). BMM from γ-chain-deficient mice produced higher levels of IL-10 in response to LPS alone which may have contributed to their increased resistance to LPS. Thus, CRP can change the balance of pro- and anti-inflammatory cytokines by macrophages stimulated with LPS, and this response requires FcR γ-chain. This activity would be expected to protect mice in vivo from the toxic effects of LPS. CRP increases the synthesis of IL-10 and inhibits the production of IL-12 in response to LPS stimulation of C57BL/6 but not γ-chain-deficient BMM. BMM from C57BL/6 or γ-chain-deficient mice were grown for 8 days as described in Materials and Methods before stimulation with LPS. 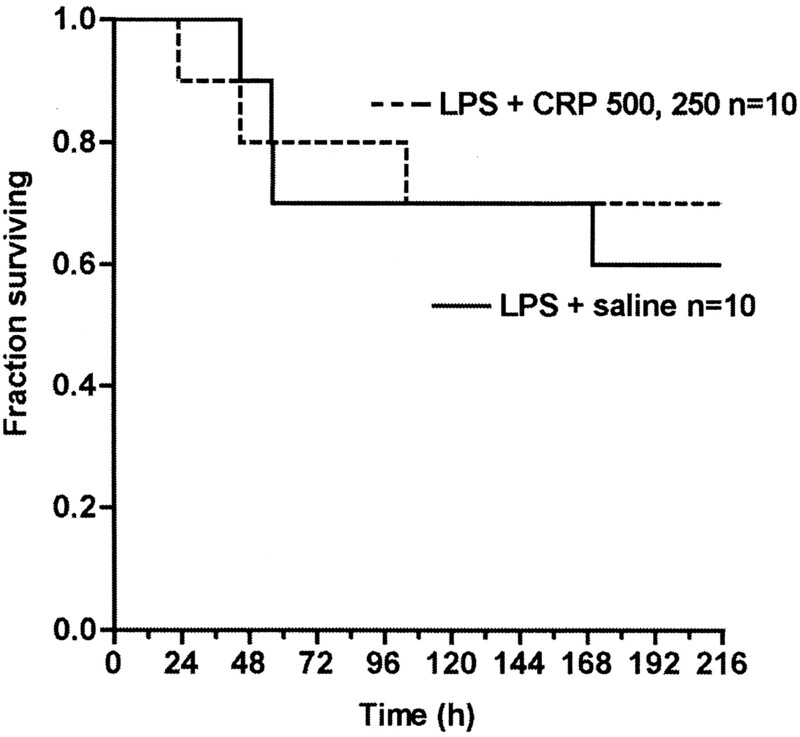 Saline or 100 μg/ml of CRP were added at time 0 with LPS. Cell supernatants were harvested at 8 h after stimulation and cytokines were measured by ELISA. The results are presented as the means and SEM of supernatants from three wells. ∗, p < 0.05; ∗∗, p < 0.01. The major new finding presented in this study is that CRP-mediated protection from LPS challenge is critically dependent on its interaction with FcγR. Furthermore, there is a balance in the interaction of CRP with the activating FcγR, FcγRI, and the regulatory FcγR, FcγRII. The presence of the γ-chain-dependent FcγR is required for CRP to provide protection from LPS, as FcR γ-chain-deficient mice were not protected by CRP. In contrast, CRP-mediated protection was also abrogated in FcγRIIb-deficient mice. These findings suggest that the effect of CRP on the response to LPS is complex and depends on the interaction between pro- and anti-inflammatory responses. The ability of CRP to protect mice from challenge with LPS was first demonstrated in a model in which rabbit CRP was expressed as a transgene responsive to diet manipulation (17). These authors showed that CRP protected from LPS as well as platelet-activating factor and galactosamine and low dose LPS, but not from TNF- induced mortality. These results suggested that the effect of CRP was perhaps upstream of TNF. The lowest dose of CRP tested that produced protection from LPS in the present study was 500 μg. As the blood volume of the mouse is ∼2.5–3 ml, this corresponds to ∼150–175 μg/ml at the initial point after injection. These levels are seen in moderately severe inflammatory reactions in humans. As human CRP is cleared with a half-life of ∼4 h in the mouse (37), the levels must be low during most of the exposure time for LPS. Thus, CRP has a relatively potent in vivo effect. It has been demonstrated using IgG complexes and IgG-coated E that cross-linking of FcγR selectively induces the production of IL-10 while down-regulating the production of IL-12 (27, 28). IL-10 is a potent inhibitor of TNF, IL-1, and IL-12 production and is protective from endotoxin shock (38). IL-12 is a potent proinflammatory molecule and overexpression of IL-12 is associated with LPS-induced mortality (28, 39). Immune complexes are expected to diminish the toxicity of LPS during Gram-negative infection. The relevance of this mechanism to acute Gram-negative sepsis is unclear, as patients with Gram-negative sepsis do not necessarily have significant levels of immune complexes. However, patients with Gram-negative infection have a very strong acute phase response with the production of very high levels of CRP and other acute phase reactants. Therefore, one of the major functions of the acute phase proteins and especially CRP may be to alter the cytokine profile to favor a moderated response to LPS. There are several ways that the innate immune system can protect mice from challenge by Gram-negative organisms and endotoxic shock. Others have shown an important role for C and natural IgM Abs to LPS in clearing LPS from circulation (40, 41). Still others have shown that other acute phase reactants are protective from LPS including α1-acid glycoprotein (42) and TSG-14 (43). The acute phase reactants are uniquely able to rapidly respond to inflammatory and toxic challenges by bacterial products. The adaptive immune system is positioned to provide later more specific responses to these mediators. In several respects, the activity of CRP in the regulation of macrophage responses to LPS are similar to those of IgG (27, 28). However, in the case of IgG, receptor ligation was accomplished by providing a ligand. In contrast, no exogenous ligand was required for the modulation of LPS responses by CRP in vitro or in vivo. It is possible that the multimeric nature of CRP allows it to cross-link receptors without a ligand (44) or that an unknown ligand is present. It is also possible that CRP interacts with a variety of ligands in vivo under conditions of acute inflammations. These ligands could include nuclear Ags released from dying or apoptotic cells, phospholipids in damaged membranes, and polycationic proteins released from activated neutrophils (reviewed in Ref. 2). In vivo it is likely that damaged tissue provides ligands for CRP. We have been unable to detect CRP binding to LPS by ELISA or any effect of CRP on binding of LPS to CD14-positive monocytes either in the presence or absence of serum. The crucial role of FcγRI in the regulation of inflammatory responses has been demonstrated. Macrophages from FcγRI-deficient and FcγRIII-deficient mice, but not FcR γ-chain-deficient mice up-regulate IL-10 in response to immune complexes (27, 45). Thus, for IgG pathways, involving either FcγRI or FcγRIII may mediate the same effect. Binding and functional assays indicate that CRP interacts with FcγRI, but not with FcγRIII (21, 32). The in vivo importance of FcγRI has recently been confirmed (45, 46) despite the presumed constant occupancy of the receptor by IgG2a in vivo. The enhanced mortality in mice deficient in FcγRIIb was unexpected as this receptor provides no positive signaling and leads to no known product. FcγRIIb does inhibit the activation of immunoreceptor tyrosine-based activation motif-containing receptors through the recruitment of the Src homology 2 domain containing inositol phosphatase (47). If the protective effect of CRP is mediated through interaction with FcγRI, as suggested by the failure of CRP to protect mice deficient in the γ-chain, then the absence of FcγRIIb may allow for a stronger activation of the activating receptors through either CRP or natural IgG. This is supported by the prolonged TNF response to LPS and the increased synthesis of IL-12 induced by CRP in FcγRIIb-deficient mice. However, the identity of the signaling pathway on which FcγRIIb is acting remains uncertain. Experiments designed to examine the mechanisms involved in this effect are planned. It has been reported that the induction of IL-10 is specific to interactions through the FcγR, but that the down-regulation of IL-12 synthesis may occur through other receptors, e.g., C receptors (48). Thus, the current findings are consistent with our earlier studies on the interaction of CRP with FcγR. In humans, CRP is present at high concentration during Gram-negative sepsis and is expected to interact strongly with FcγRI and FcγRII but not FcγRIII. Previous studies have suggested that CRP plays an anti-inflammatory role in models where polymorphonuclear leukocyte (PMN) influx and damage are predominant (15, 49). These studies suggest that CRP has a direct effect on PMN activation and trafficking. However, it also seems likely that the interaction of CRP with macrophages could regulate PMN activation through the generation of IL-10 and other anti-inflammatory cytokines, e.g., IL-1RA. It was reported recently that transgenic mice expressing human CRP are resistant to experimental allergic encephalomyelitis (50). These investigators reported an increase in IL-10 production in cultures of encephalitogenic, nylon wool-enriched T cells incubated with APC and CRP. Although they concluded that CRP acted directly on T cells to decrease production of macrophage-inflammatory protein-1α, they postulated that IL-10 production could also contribute to the protection from experimental allergic encephalomyelitis by CRP. Our results are consistent with these findings and expand upon them, showing a reciprocal decrease in IL-12 implicating FcγR ligation as the mediator of these cytokine alterations. Our studies have focused on CRP interaction with macrophages and we have not yet examined whether T cells are involved in this regulation. The synthesis of CRP is stimulated primarily by IL-6 and levels of CRP are strongly correlated with serum levels of IL-6. Although CRP can activate the complement cascade and enhance phagocytosis, it now appears likely that a major function of CRP is to broadly down-regulate the inflammatory response. This inhibition is mediated by ligation of FcγRI, which leads to the production of IL-10 and the down-regulation of IL-12 responses to LPS. The timing of CRP in the acute phase response would appear to be ideally suited for such a regulatory role. Thus, in addition to its role as a scavenger molecule that recognizes the products of cell damage and necrosis to ensure their clearance, CRP is positioned to limit the inflammatory damage induced by infection or trauma. The results of these experiments suggest that the actions of CRP (and other members of the innate immune system) are complex. CRP can protect from infectious organisms at low doses through interaction with the C system by activating phagocytosis and clearance of Streptococcus pneumoniae (51). CRP can also potently down-regulate the response to proinflammatory stimuli like LPS by binding to FcγR, stimulating the production of IL-10 and blocking the production of IL-12. These experiments are the first to define a requirement for the FcRs in an in vivo process mediated by CRP. ↵1 This work was supported by the Department of Veterans Affairs and National Institutes of Health Grant AI28358. ↵3 Abbreviations used in this paper: CRP, C-reactive protein; BMM, bone marrow macrophage; PMN, polymorphonuclear leukocyte.